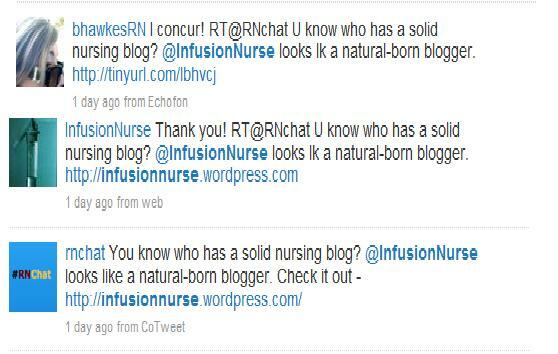 I mean, my infusion nurse blog is a year old this month!!! 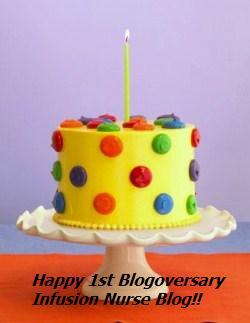 Gosh, it’s hard to believe a year has gone by…it’s my first blog-o-versary!! My first blog was posted on August 18, a week after my blog site, infusion nurse blog was created. My goal was to share information about infusion therapy, vascular access, infusion nursing and related topics, basically to spread the love and joy of infusion nursing!!! 🙂 I have shared 62 posts and my blog stats have increased, from just a few of my friends/co-workers (who felt sorry for me) to over 200 views/day and growing!! YAY! !…I know it’s not record breaking stats but it’s good enough for this infusion nurse. “Just say No”…my blog about avoiding the antecubital fossa when starting IV’s. “Phlebitis – the sequeal” …my blog about using the phlebitis scale to identify and document phlebitis. “Just my observation, why do nurses reuse alcohol swabs”…my blog about…..yup, you got it. “Nurses + Artificial Nails = Bacteria” – my blog about artificial nails and the potential danger for our patients. Thank you, it has been a great first year and you have been so kind and supportive. I am deeply humbled that you have subscribed, read my posts, shared with your friends/colleagues, and have posted comments. Most of the comments are professional and very rewarding especially when my blog has made a difference to someone or to a handful of nurses. Through the nursing social networks on Twitter and Facebook, I am very fortunate to meet several colleagues who have inspired me. Most of them have their own blogs and are listed on my blogroll. I have learned so much from them and appreciate their support. One tweet in particular has given me the motivation during my early blogging days to continue to blog and for this I am very grateful…thank you! And now….to infinity and beyond!!! I am looking forward to your continued visits to my blog, to your friendship, and all the fun that comes along with it!!! Cheers! !